Just a fragment of writing today: i have no expectation that this will be a definitive exploration. 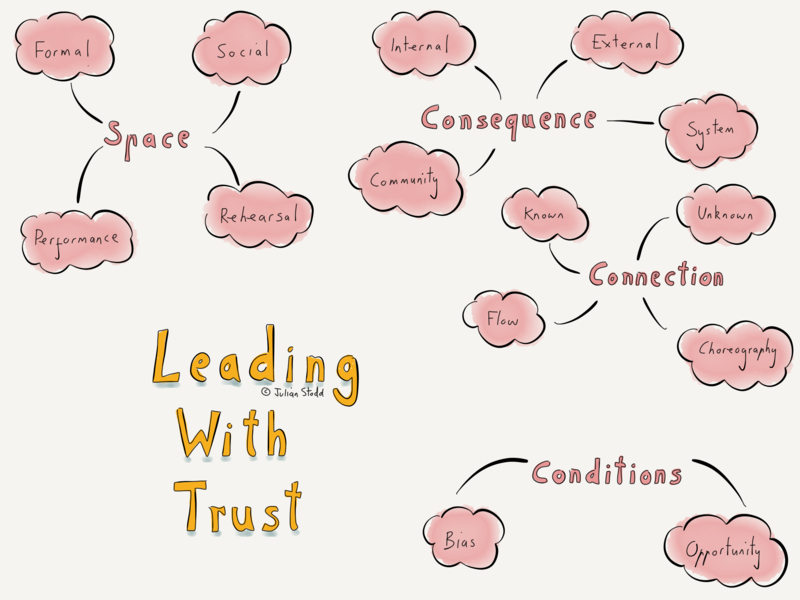 I shared some of the newer work on ‘Leading with Trust’ today, at an HR conference. I’m intending to develop this out further next year, as an extension, or flavour of, the Social Leadership work, as there is a great deal of interest specifically around the ‘trust’ component. You cannot demand trust, but you may be able to create the conditions where it can emerge, and grow. We know from the Landscape of Trust research that ‘trust’ is held in relationships more so than contracts, so it’s perhaps in the way we forge, and validate, and maintain, those relationships that we are best placed to take action. It is a little like gardening: you tend to the soil, and the seeds germinate. You do not directly make them germinate. If the conditions are right, they will grow. Creating the differentiated spaces, both in our busy days, and in different contexts, from formal, to social, must be part of this. Understanding the types of consequence that apply, and our ability to vary, or control, them. Mastering the range of connections that we must build, and the choreography of how they are formed: in the ‘Conditions for Community’ research, there was a clear expression of how the ‘choreography of welcome and engagement’ was deemed to be central to success. The way that we create the conditions for trust will vary: it’s a matter of personality, and style, but there will doubtless be some common themes we can track. Creating spaces, understanding consequence, facilitating connections, social recognition, fairness. The journey to lead with trust may be to learn this landscape, and create those conditions. This entry was posted in Leadership, Trust and tagged Community, HR, Landscape of Trust, Leadership, Pride, Trust. Bookmark the permalink.